This weekend I had an opportunity to stop by one of my favorite grocery stores: Seafood City. It’s not all seafood, but they do have a good selection of fresh seafood and meats. Oh, I should probably mention it’s a Filipino store. While I can’t do 100% of my shopping there, I do get to pick up on some staple items that I don’t always get at other stores. I used to go there all the time before I moved, but now, I only go if I’m in the area. One of my daughter’s favorite Filipino dishes is chicken adobo. Depending on the province the family comes from, will depend on how the meal is prepared. It’s a simple recipe: chicken legs (or thighs, wings…you choose), soy sauce vinegar, bay leaves, fresh garlic and whole peppercorn. I’ll make sure to leave the recipe before all is said and done. I headed over to the meat counter to see what was available. Remember, I always shop the sales. I didn’t read the sale ticket correctly, because my husband had to point it out, when I overlooked the chicken legs. I read, “50 cents off”. The ticket actually read, “50 cents per pound”. Wait! Seriously? In a time when meat prices are rising through the roof, there’s a store offering chicken for 50 cents per pound? Sure enough, that was the price. Their regular price was $1.39 per pound. This chicken isn’t frozen either. It’s cut up fresh and sold at the meat counter. 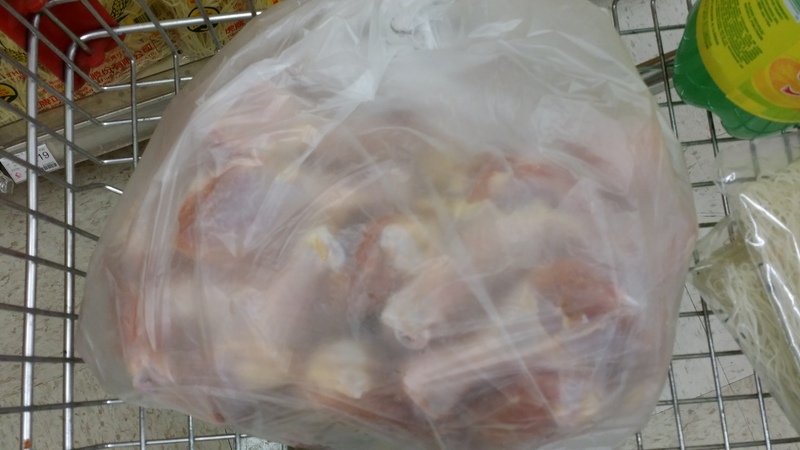 It was the first time in my life that I purchased 10 pounds of chicken in one trip. I couldn’t help myself. I mean at 50 cents a pound, that’s over half the price I normally spend. If we are what we eat, I expect my family to start sprouting feathers soon. We eat a lot of chicken because it’s the most affordable meat right now. I also misread the ground pork sale tag, but didn’t realize that until I was at home. I thought the ground pork was $2.99 per pound. Turns out it was only $1.99 per pound. I would have gotten more had I known. I guess the chicken score threw me off my game. I continued my shopping. My daughter was elated that she would have her chicken adobo for dinner. I needed a few more supplies though. When I make adobo, there is no substitution for the Filipino soy sauce and vinegar I use. It has to be these exact items or I just don’t make it. I once tried a different vinegar and then again, a different soy sauce, not the same. The reason for the variations, I had sent my husband to pick up the items. That was before I sent him with a picture of what was needed. 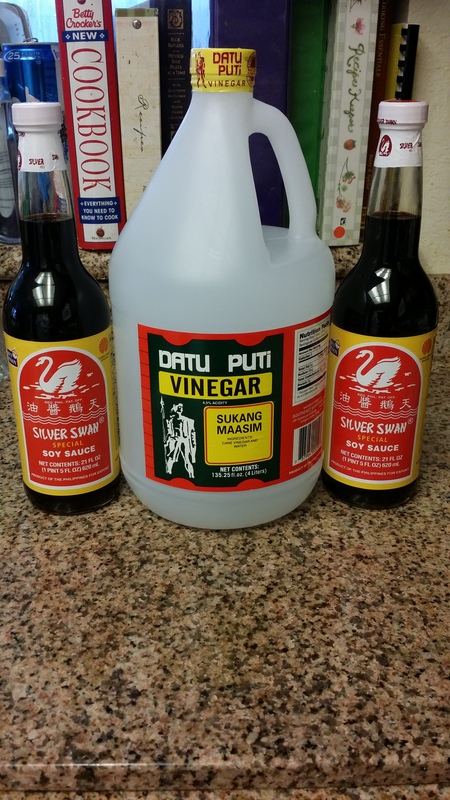 I always use Silver Swan – Special soy sauce and then Datu Puti vinegar. These were both on sale, so you know I had to scoop them up. We decided to get some pancit noodles. Again, variety galore and preference when choosing noodles. I prefer the bihon noodles. These are thin, rice noodles (think rice angel hair pasta). My husband on the other hand, prefers the canton noodles, which are an egg noodles and a lot thicker. Thicker than spaghetti. Pass. As I am the only cook in the house, guess which noodles we picked up? You got, the bihon noodles. He wants canton? Then he can go buy some from the Filipino restaurant when he’s at work. Gather up some coconut milk, some carrots and a few other items and head to the register. I just needed those items. Not related to the dishes I was preparing. When all is said and done, I’m still in a state of shock over the chicken prices. I told the hubby, I need to go back and get more. It’s just too good a deal to pass up and it’s not like we won’t eat the chicken. I headed back to the meat counter and ask for another 10 pounds of chicken legs. They must think I’m throwing one hell of a party. Now, if you’re keeping track, this family of 3, has just purchased 20+ pounds of chicken for $10.80. Ok, so I would be wrapping and freezing chicken legs, but it’s a small inconvenience when savings like that are in play. I made the adobo for dinner, using five pieces of chicken. Then I set to wrapping and freezing the remaining chicken. I put 6 legs in each package. I ended up with 10 packages of chicken. The math on 11 meals is 98 cents per meal. There’s only one thing that can be said; SCORE!!! I didn’t forget about the chicken adobo recipe. This is how we make it. Again, there are many, many, many version of this dish. Just depends where the family originates from in the Philippines as to how it’s made. Marinate the chicken in the above ingredients, minus the bay leaves, for several hours or over night. (This step is optional). Place all the ingredients in a pot, bring to boil. Once boiling, reduce to simmer, cover at an angel to allow some steam to escape. Cook for 45 -60 minutes. Serve over steamed rice. Note: Cooking time may vary if you choose to use a different cut of chicken. Adjust accordingly.